Windows only: Freebyte Task Scheduler is a free and portable task-scheduling application. If you're looking to round out your suite of portable applications or find yourself locked out of accessing Windows Scheduled Tasks on your work machine, Freebyte Task Scheduler gets the job done. It has a simple and familiar interface for adding and modifying tasks. You can set tasks for one shot, daily, or weekly launches. 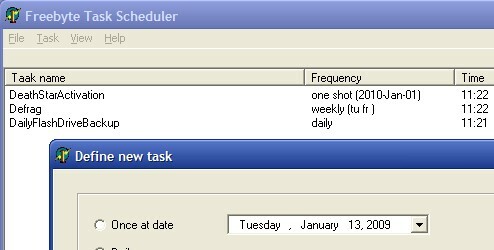 Freebyte Task Scheduler is freeware, Windows only. Do i have to run the application everytime i want my tasks to be executed or it can be closed and still works?